I have recently created a “professional” Twitter account to have on my website so visitors wouldn’t judge me on the nonsence that plagues my original Twitter daily. I make it a practice to follow only media sites and bloggers and distinguished profiles like that. I saw that CNN Tweeted a story about women STILL earning less than men. Well, as a woman, who hopes to earn a great deal in her future, this story naturally intrigued me. So, after ReTweeting it, I followed the link to a story titled “The Gap Remains Between the Sexes when it comes to Income” about how most women still earn 25% less than men in the career field. Not very promising in this economy… and it is mostly due to the fact that most women have not “caught up with me in college attendance”. I guess this proves the old saying that Knowledge really is Power. Usually on Mondays, my 361 class has News Quizzes. So I spent most of my free time that day studying for the dreaded pop quiz on pop culture. I journeyed to my gt-to-site for news, CNN.com. It was on the home page that I found out that one of my favorite actesses, Jane Russell had just passed away. She was in one of my favorite old-school movie “Gentlemen Prefer Blondes” with Marilyn Monroe. I immediately phoned my mom and we had a small pity partie over the phone. I got o caught up in this story I forget to even study for my news quiz! Thankfully, we didn’t have one. Sunday was a busy day for me. I was in the News lab editing packages, websites, and trying not to get caught eating near the computers. I usually get my new from the TV monitors in the News Bubble when I know I’m going to be in the Bubble all day. On one of the moniters in the lab, they were showing ABC7 during the Academy Awards. The King’s Speech won best Motion Picture. After the Awards had ended, the news started. They showed a feature story on a student at the University of Maryland who stutters and sings! It was a very cute story from what I could hear over the buzz in the Bubble. So I know I’m late the whole Charlie Sheen bashing-bandwaggon. But I saw on Twitter that they were canceling the show “Two and a Half Men”. Now, although I detest that program, I know it is one of the longest running shows ever so I had to find out what was really going on. So, I Googled Charlie Sheen. 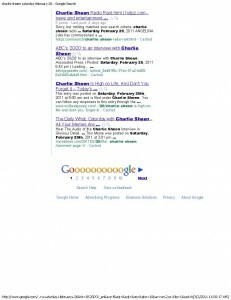 The search results (Seen below) were filled with blogs and sites all about poor old Charlie. I went to a very visited blog site called “Deadline Hollywood” to see what was up. Typical celebrity drug rage. Sheen went into a rant on the set. Looks like 1.5 men and addict won’t necessarily work out for a new series. Friday was a very interesting day to start a media diary. 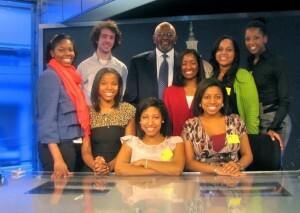 On this day, the Maryland Association of Black Journalist took an actual media tour (the first of the semester). And where did we go, to the studio of NBC4 to watch the taping of their 6 o’clock news program! What a way to get news! We watch as anchors told stories about the strong winds toppling power lines across the D.C. Metropolitan area (on light fixture fell and stopped the Red Line for the Metro, we almost didn’t get to NBC!) and watch as weatherman Doug Haggerman told views (at home and in studio) about the weather roller coaster we’d be experiencing this week. Afterwards we even got to talk to Jim Vance. It was like watching the news and experiencing it all at once. So just what did Jolie learn? Well, I learned that a lot of my news come from word of mouth, what people Tweet, text or tell me. But, bing a naturally nosy person, I have to do further research and find out more about what I read or hear. But as a busy working/school girl, I don’t always have time to sit and read a paper, or watch the news, or even go online to find news. So, maybe I’m ill-informed or media illiterate. But I depend on what I may hear or experience to get my news. It was a bit odd to read the media diary backward at first but it seemed to work out fine. It was interesting to read through the eyes of a CNN.com reader, as I do not normally think to go to a nationwide television station’s website for world news. It was helpful to note all the different sources of news you relied on throughout the week. It seems as though Twitter is a helpful tool for staying in touch with what you care about. I generally do not use Twitter in this way, but perhaps I should start. It would have been nice to have more direct-to-story links and screen grabs of the online stories. In general, the pink words were good idea for this blog because it brightens the page up from just the average boring blog. I liked the MABJ picture at NBC…it was a nice touch and pretty cool as well. I think it is a very good idea to create a separate Twitter account that separates business from pleasure. In fact, after reading this, I may consider doing the same. Next time use anchor tags at the top, however, just so it is easier to navigate from day to day. But overall I enjoyed reading this blog.